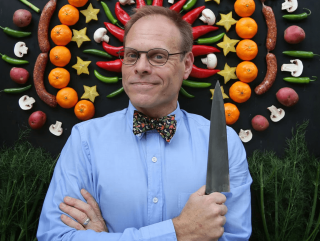 Chef Alton Brown, known for his show Good Eats and for hosting Cutthroat Kitchen, will talk about and sign copies of his latest cookbook, EveryDayCook. The speaking portion of this event is free and open to the public. Tickets are required to join the signing line, and are only available with the purchase of a copy of EveryDayCook from BookPeople. Books and tickets will be available September 27. Purchasing a book online automatically assigns you a ticket for the signing. There is no separate "ticket" item to add to your cart. Tickets are lettered. The line for the signing will form according to ticket letter after the author speaks.